How is it that a full month has gone by since I've found time to blog? I guess this is a good thing, as luxury travel is back and we're busier than ever. That said, I'm overdue for a post on the Four Seasons Westlake Village and the adjoining California Health and Longevity Institute (CHLI)as it's an incredible place...and just 40 minutes from my home in LA. More than just another fabulous Four Seasons hotel with a terrific spa, this property takes it to the next level when it comes to the health/wellness options available. I confess: I really wasn't that interested in meeting with a fitness consultant at 8am on a Monday morning but after meeting Michael Brazeal, the Center's Director of Fitness, I quickly changed my tune. While I had enjoyed a very relaxing Sunday by the hotel's adults'-only spa pool followed by a "healthy" room service dinner in my spacious one-bedroom suite, my true appreciation for the hotel and CHLI came after tasting the latter's offerings the following day. In less than an hour, Michael had me saying "I can do that" to his suggestion of adding one more day of cardio to my existing gym routine. Same to his suggestion of cutting 100 calories/day out of my total diet. He didn't tell me to do these things because I am horribly out of shape, but because I'd asked him during our consult how to best maintain my weight and rev up my metabolism as I inch up there in post-40 years. Michael's tips are now stuck in my brain forever and I've found myself making time for (and looking forward to) my now nearly-daily cardio work outs. I've also broken my green tea soy latte habit and cut down on luna bars as a way to easily reduce daily calorie count. 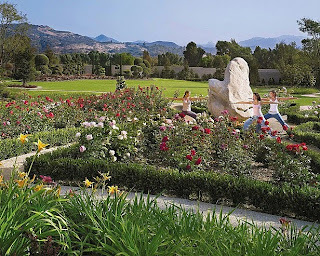 My morning at the Spa and at CHLI included the best facial I've ever had (an 80-minute anti-gravity facial) in a Zen-like spa setting followed by a session with the incredible Barbara Savin, an energy healer/hypnotherapist. I've had energy work done in the past, but never with the effect of my session with Barbara. I can't really explain how her work works...but I do highly recommend it to everyone as we can all benefit from the removal of energy blockages. My favorite part of the day was meeting with Siobhan Palmer, director of CHLI, who showed me around the facilities once I was worked out, spa-ed and energized. The Center has a full suite of top-notch doctors, dentists, radiologists and beyond, all who work together to prescribe a program that incorporates a "360 degree approach to health". Many corporations contract CHLI to provide day-long comprehensive physicals for their execs, with the goal of reducing long-term health care costs. It's a genius concept. As is 87-year-old owner David Murdock locating CHLI on the grounds of the gorgeous 270-room Four Seasons Westlake (across from the headquarters of his Dole Foods Corporation)! One night/day at Four Seasons Westlake/CHLI has had the same effect on me a weeklong visit to a destination spa resort did several years ago. I'll return for sure...on many occasions, to be pampered and energized as well as checked up by the on-site doctors (they even include mammograms in physicals for women over 40). Other fave features of the property include Onyx restaurant with sushi by Chef Masa AND a hands-on wellness kitchen for anyone who wants to boost their healthy cooking habits), as well as the stunning Oriental-inspired Zen garden (complete with a full-scale pagoda Murdock imported from Beijing). The pet-friendliness of the property is another plus. Our Preferred Partner rates at Four Seasons Westlake include daily breakfast for two (if you go Saturday night this means Sunday brunch!) as well as an $85 lunch credit and an upgrade if available. Contact us at 310.979.9036 or via email stacy@elitetravelinternational.com for more details or to set up your stay!